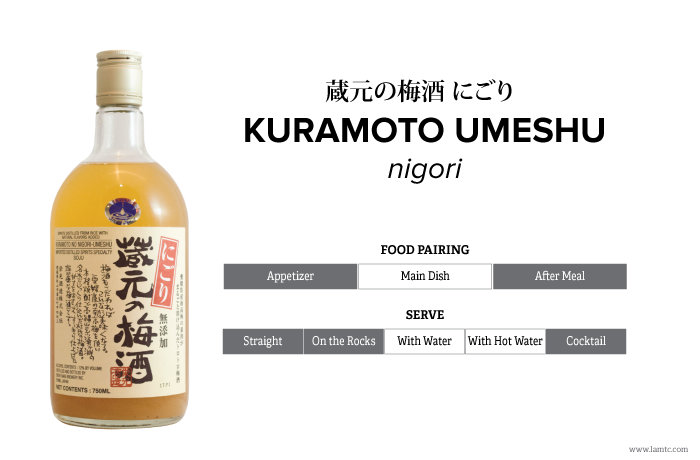 Kuramoto Nigori Umeshu is Eikoh Brewery’s newest plum soju, a spin-off of their original Kuramoto No Umeshu. This Shochu-based plum liquor contains fine pieces of succulent nakoume pulp, giving the beverage a cloudy appearance and more viscous, full-bodied texture. By only using selected premium ingredients with absolutely no additives, the refreshing natural tang and the sweetness of the fully ripened fruit masks the sharpness of the rice Shochu creating well-balanced mellow liquor.